2000cfm, with pre-filter, carbon filter and 99.97% efficient HEPA filter. The model 2000HS is setting the standards for providing HEPA and Carbon based filtration technology for use in commercial, industrial, institutional and large residential applications where reduction and removal of airborne contaminants is required. The unique split-housing design and powerful 2000 cfm blower makes the 2000HS a system that can be used either in conjunction with an existing HVAC system, as a stand-alone unit or even as an air handler and fresh air ventilation system. The 2000HS is designed to attach to any 5 ton or larger HVAC system. A single unit is used for all residential 5 ton units and multiple systems can be used for commercial HVAC systems over 5 ton capacity. The 2000HS HEPA Shield is perfect for office buildings, schools, clinics, printers, veterinarians, beauty salons, hospitals, dentist offices, clean room applications, and any commercial process requiring clean air. In addition, the 2000HS unit can be used to remove cigarette smoke and tobacco odor from restaurants, offices, bingo halls…etc. 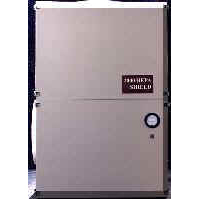 The 2000 HEPA Shield can also be used to introduce fresh, filtered air or act as an air handler and be used in a stand-alone configuration. » Integrates into existing HVAC system. 2000HS PLUS Options: » Adaptation of 2000HS base unit allowing for two speed operation with programmable home thermostat. 2000HS Stand-Alone Options: » Adaptation of 2000HS base unit used to tie into a separate system without a thermostat. 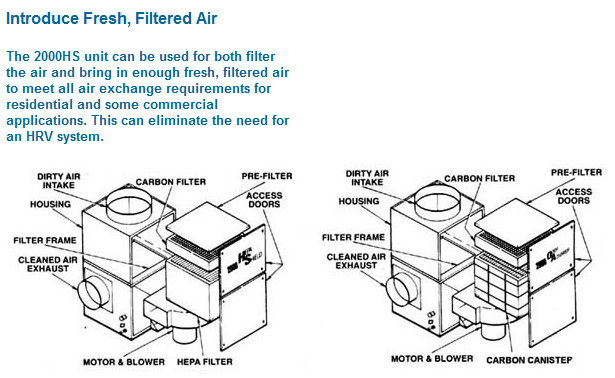 2000OA Options: » Contains additional carbon and no HEPA filter. 2000OA PLUS Options: » Adaptation of 2000OA base unit allowing for two speed operation with programmable home thermostat. 2000OA Stand-Alone Options: » Adaptation of 2000OA base unit used to tie into a separate system without a thermostat.